FC Barcelona will travel to the United States on Tuesday for the first mixed tour in Club history. The teams coached by Ernesto Valverde and Fran Sánchez will be together from 24 to 29 July in the cities of Beaverton (Oregon) and Los Angeles. In Beaverton, both teams will visit Nike’s headquarters and will participate in joint commercial activities and events. In Los Angeles, the first team will play Tottenham in the International Champions Cup (ICC), a competition organised by Relevent Sport, and they’ll also travel to the cities of Dallas and San Francisco to play against Roma and Milan, respectively. Four hours before each game there will be a Fan Zone open to the public, so the fans can get up close and personal to Barça and learn more about the Club's history and philosophy. The Barça Women will play their first pre-season friendly match against SoCal FC, of ​​the Women's Premier Soccer League. It will be held on Saturday 28 at 10.00am in the 10,000 capacity Drake Stadium, and will see debuts for Stefanie Van der Gragt, Kheira Hamraoui, Pamela Tajonar and Andrea Pereira . Aside from the games, there will be an intense parallel agenda of institutional events for both teams, the tour allowing the Club to take advantage of its commercial and branding strategy, as well as a social commitment which is part of the Club's identity and channeled through the Foundation. From the point of view of the global implementation of the Barça brand, the American market remains a priority territory, and the west coast was chosen as the destination this summer as part of the Club’s Strategic Plan to generate more economic revenue. It’s the eighth time in Barça’s history that they’ll enjoy a pre-season in the United States, and the second consecutively. Their first ever, some 81 years ago in 1937, was crucial for the survival of the Club. The institutional presence of the Club will be headed by President Josep Maria Bartomeu, who will be in Portland and Los Angeles. First vice president, Jordi Cardoner, will accompany the delegation during his stay in Portland, Los Angeles and San Francisco along with vice president of sports, Jordi Mestre. Managers Jordi Moix, Maria Teixidor, Joan Bladé, Josep Ramon Vidal-Abarca and Emili Rousaud will do the whole tour, whilst Enrique Tombas and Oriol Tomàs will stay until Dallas and Dídac Lee wil only go to San Francisco. • 16.30: Departure of the FC Barcelona expedition on IB2881 flight to Portland (CEST). • 18.30: Arrival of the FC Barcelona expedition to Portland, then transfer to the Dossier Hotel, Portland. • 08.00: Barça Women training at Ronaldo Field 2 (open to the media for the first fifteen minutes). • 09.50: Group photo of the first team and Barça Women. • 10:00: First team training at Ronaldo Field (open to the media the for first fifteen minutes). • 19.00: First team training at Ronaldo Field. • 10:00: First team training at Ronaldo Field (open to the media for the first fifteen minutes). • 11.45: Barça Women training at Ronaldo Field 2 (open to the media for the first fifteen minutes). • 14.00: First team and Barça Women at the Nike store in Portland. • 17.30: Departure of the FC Barcelona expedition on flight 5Y 8516 to Los Angeles airport. • 20.00: Arrival of the FC Barcelona expedition to Los Angeles airport, then transfer to the Beverly Wilshire Hotel, Los Angeles. • 10:00: First team training at UCLA North Athletic Field. • 10:00: Institutional act at the Hotel Beverly Wilshire with the presence of President Josep Maria Bartomeu. • 12.00: Barça Women training at UCLA North Athletic Field. • 17.00: Barça Women training at UCLA North Athletic Field (open to the media after 6.00pm). • 18.15: First team press conference at UCLA. • 19.00: First team training at UCLA North Athletic Field (open to the media for the first fifteen minutes). • 7:00 pm: Barça Welcome Party. 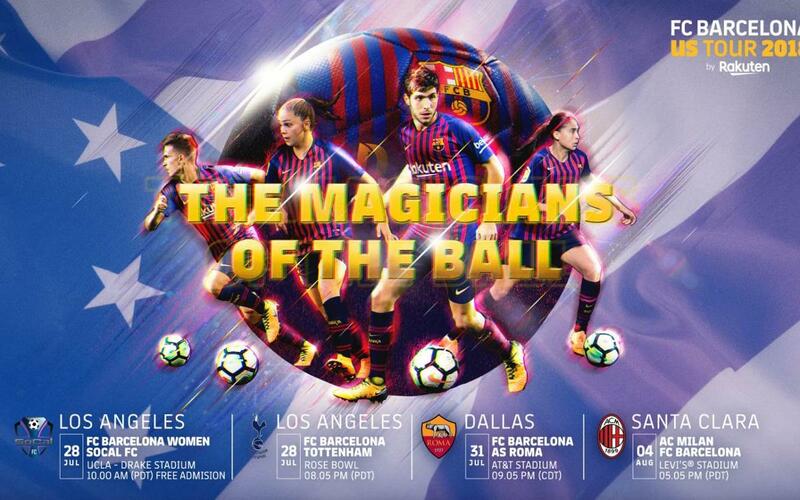 • 10.00: FC BARCELONA WOMEN - SOCAL FC. Drake Stadium. • 20.05: FC BARCELONA - TOTTENHAM HOTSPUR. International Champions Cup. Rose Bowl Stadium. • 11.45: Rakuten Clinic with the presence of Barça Women's players at UCLA North Athletic Field. • 13.15: Barça Women training at UCLA North Athletic Field (open to the media for the first fifteen minutes). • 15:00: Departure of FC Barcelona expedition on flight 5Y8516 to Dallas airport. • 20.00: Arrival of FC Barcelona expedition to Dallas airport, then transfer to the The Joule Hotel, Dallas. • 18.30: First team press conference at the AT & T Stadium. • 19.00: First team training at the AT & T Stadium. • 19.00: Visit to the Penya Blaugrana in Dallas. • 21.05: AS ROMA - FC BARCELONA. International Champions Cup. AT & T Stadium. • 11:00: Departure of the FC Barcelona expedition on flight 5Y7762 to San José airport. • 12.30: Arrival of the FC Barcelona expedition at San José airport, then transfer to the Four Seasons Hotel San Francisco. • 17.30: Barça Innovation Hub. • 19.00: First team training at the San José Earthquakes facilities (open to the media for the first fifteen minutes). • 10:00: First team training at the San José Earthquakes facilities (open to the media for the first fifteen minutes). • 19.00: First team training at the San José Earthquakes facilities. • 14.30: Visit to Facebook offices. • 19.00: Welcome to the Rock of San Francisco. • 17.05: FC BARCELONA - AC MILAN. International Champions Cup. LEVI'S Stadium. • 22.00: Departure of FC Barcelona expedition to Barcelona airport. • 20.00: Arrival of the FC Barcelona expedition to Barcelona.